bongostaple » November 13th, 2016, 10:23 am wrote: Anders, your post reads as though you haven't taken the time to read any of the thread you have replied to, never mind any other threads on CF dealing with this subject. Is it too much to ask that you read all of the previous discussions before making a decision on whether to post on a subject? I looked briefly at the posts in this thread, but ok I will take another look. nonhocapito » March 28th, 2012, 5:30 am wrote: Nobody relinquishes power willingly. I think that this is true even if you're a puppet. So we can safely assume that, if the assassination of JFK was faked, it must have happened with the reluctant collaboration of JFK himself. Let's assume JFK was told: either we take you out, or you pretend to be taken out and disappear to Argentina (or wherever) like Adolf Hitler. Fine. Facing the possibility to be actually killed, the rich white boy would accept to fake his own death and disappear. But then Culto makes assumptions in that thread that would require not only for JFK himself, but for his wife, aides and all to rehearse over and over the killing in order to make it look legit to... to whom? A planted cameraman, Zapruder, the only one who actually came back with some film? Then they would have the film surface, clearly doctored, but not enough to cover up the errors, years and years later...? Why rehearsing so hard to fake something that is not at all documented if not for one very suspicious tardy piece of film and a couple of "before" and "after" pictures? I mean, everything is possible but if the killing has been faked and staged (requiring as I said to rehearse for it with fake blood cartridges and fake reactions of fear and fake dying and all), I think they would have profited from it much more extensively --or else they would have made it simpler (or a completely undocumented event, with no need for anyone to act out anything, especially not your VIP victim). One possibility is that JFK was playing a figurehead role including a planned participation in a faked assassination. Jackie was then playing a role too along with many other participants. U.S. Presidents of course do a real job but I think their roles are very scripted, particularly in the case of JFK. And the reason for all the effort of staging the JFK assassination like that was probably to fool not only the general public but also to manipulate the whole power game in politics. EDIT: Hypothesis: JFK's script included the announcement of the moon program and staging his own assassination. One of the purposes of the Zapruder film was to train the U.S. government, including experts, to deal with fakery and cover-up within the government (the Zapruder film was released to the public many years after the event). This was a preparation for the much bigger Apollo moon mission hoax. This is by far the stupidest thing you have written. Effete clowns. Forrest Gump is going to do what? A real job has been done on you by the MMS, Propaganda and Hollywood. Anyone else find it hard to believe that the 'acting' President would be driving around in a convertible waving at fans? (and pre-announcing the date, time and route). aa5 » November 13th, 2016, 1:14 pm wrote: Anyone else find it hard to believe that the 'acting' President would be driving around in a convertible waving at fans? (and pre-announcing the date, time and route). Now that you mention it, that very notion alone does sound ridiculous. In hindsight, I find it quite interesting how this JFK character was taught (to US) in school, and in the media over the years. I suppose, at the time at least, there wasn't anything particularly funny or insightful about him being called the "First TV President". But now we will have the 11th TV President in the form of a Trump, which should be making plenty of noise, and providing endless amounts of infotainment for the bored and the duped. I can't hardly avoid the thing, with it being blasted everywhere. To be certain, it will be the "gift" that keeps on Taking. 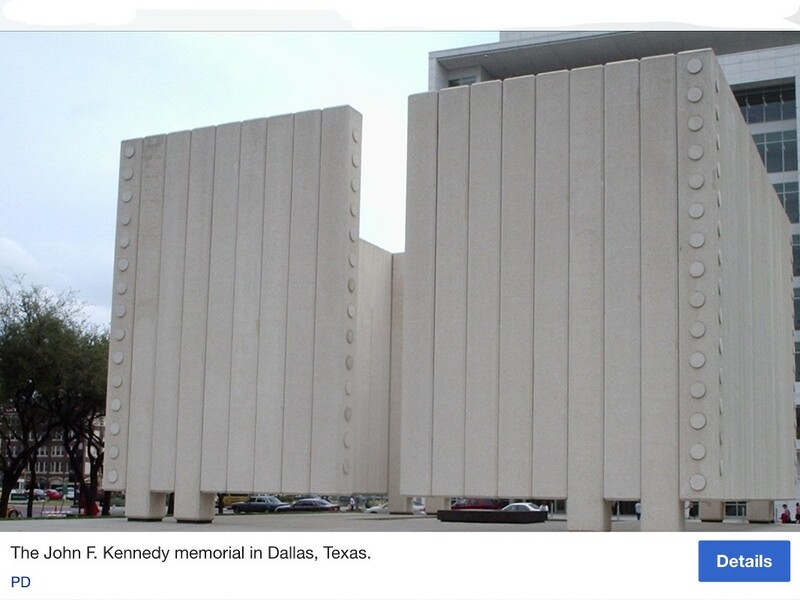 Meanwhile, just for fun, I looked up the official JFK Memorial in Dallas. And to my astonishment (not), here it is in all its glory. Remind anyone of anything? SacredCowSlayer » November 20th, 2016, 4:58 am wrote: Meanwhile, just for fun, I looked up the official JFK Memorial in Dallas. And to my astonishment (not), here it is in all its glory. Remind anyone of anything? @corsarino if the image description is correct then the above is a reenactment of FK being shot in Dallas, Texas. Image Description	4-15-1991.. This is a scene being shot for Oliver Stones movie, JFK. the jfk concrete memorial has always looked strange to me. It is almost like some sort of brutalist art. is the wtc one black? Garrison told "And yet another shot may also have been fired; frames 208 to 211 of the Zapruder film, which were deleted from the Warren Report — presumably as irrelevant — reveal signs of stress appearing suddenly on the back of a street sign momentarily obstructing the view between the grassy knoll and the President’s car. These stress signs may very well have been caused by the impact of a stray bullet on the sign. We’ll never be sure about this, however, because the day after the assassination, the sign was removed and no one in Dallas seems to know what became of it." What must I do think?